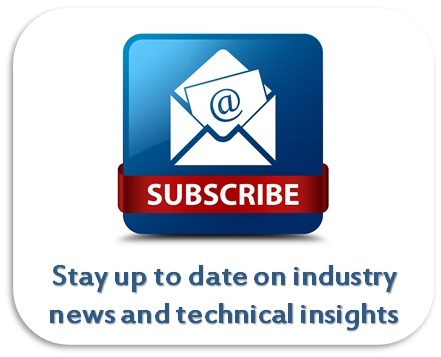 Installation of Multilayer Insulation – Things to Avoid - Meyer Tool & Mfg. Multilayer insulation, the most common form of radiation shielding used in cryogenic systems, is also called superinsulation for a reason. 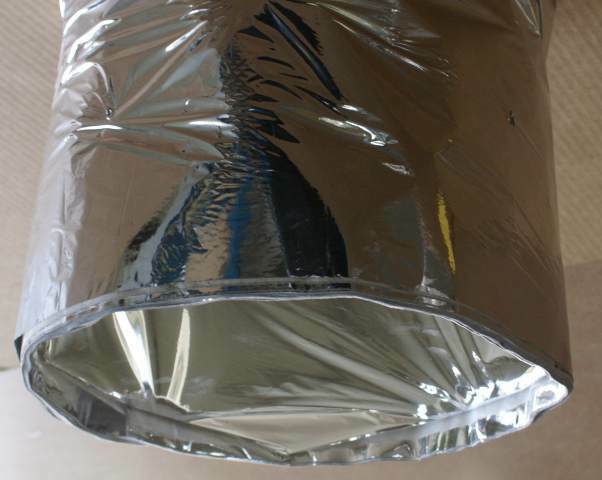 When properly installed it is a relatively low cost and highly effective thermal insulation system. However, when improperly installed, that effectiveness will be degraded. The effects of poor installation technique can range from almost unnoticeable to severe, depending upon the misapplication. "Short circuiting" the cold side of the blanket to the warm side. Creating a path through which the cold layers of the blanket can "see" a warm surface. An ideal multilayer insulation blanket is a multilayer radiation shield, with each layer mechanically isolated from the next and exchanging heat with adjacent layers only through radiation. The more layers there are, the greater the reduction in heat radiated to the cold surface. Creating a direct thermal link from the outer warm layer of the blanket to the inner cold layer defeats this mechanism. One way to create such a "short circuit" is to tape the warm and cold layers of the blanket around the edge of the blanket. This may produce a neater appearance, but degrades the thermal performance of the blanket. Overlapping excess length of a blanket will also "short" the warm side to the cold side. Ideally, when edges of a multilayer insulation blanket meet, they would be joined one layer at a time to produce a continuous blanket. In practice, because of the large number of layers, seams are often made by joining groups of layers. 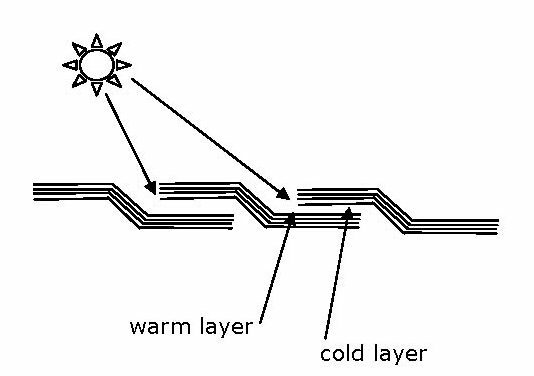 Another way in which a multilayer insulation blanket installation will be degraded is through penetration of radiation from a warm surface directly to the cold layers of a blanket. Again, this can happen if two blankets are not properly joined when they meet. For example, in Figure 3, blankets are placed on the bottom and sides of a vessel in a way that leaves the cold layers of the side blanket "looking" at a warm surface. 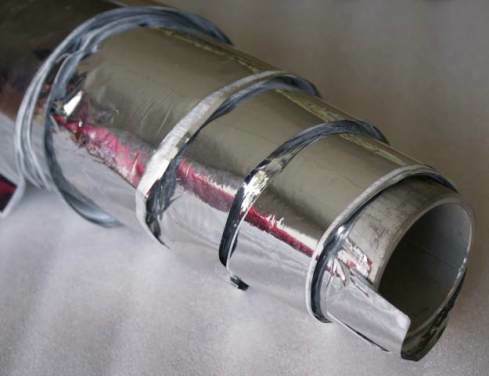 Spiral wrapping is a technique often used to insulate piping, particularly around elbows and branches. Incorrect spiral wrapping will both short the warm and cold layers of the blanket together and leave the cold edge of the blanket exposed to thermal radiation from surrounding surfaces. Ideally, spiral wrapping would also be done one layer at a time and overlap between joints would be avoided. In practice, spiral wrapping is often done several layers at a time. Properly joining seams in a multilayer insulation blanket system will avoid many of the problems described above. However, there are situations in which the best course of action may not be as clear. For example, in the case of a tube extending from a vessel at 77K to a vessel at room temperature we would often place a spiral wound blanket around the tube (by spiral wound we refer to long sections of multilayer insulation wound around a form as opposed to short sections spiral wrapped). The upper end of the blanket will be facing the warm wall of a vacuum vessel. Simply leaving the end of the blanket open could allow radiation to penetrate to the cold surface. Ideally we would like to terminate the inner layers on a cold surface and the outer layers at the warm surface, with the intermediate layers terminated at the appropriate intermediate temperature. We rarely have precise information about the temperature profile in transition regions. Furthermore, it is often impossible to gain access to the blanket at the points where it would be desirable to make terminations. In this situation it is common practice to bring the end of the blanket well into the warm region and to leave the end open. At Meyer Tool we train our technicians in proper multilayer installation techniques. We have learned in that training process that details taken for granted by experienced installers are not intuitive and often don't make sense at first to trainees. The insulation systems most people are familiar with are primarily intended to reduce convection and conduction heat transfer. Multilayer insulation systems, however, primarily address the reduction of radiation heat transfer. So "common sense" experience will get you into trouble. ​Everyone at Meyer Tool strives to follow best practices whenever fabricating and installing multilayer insulation. 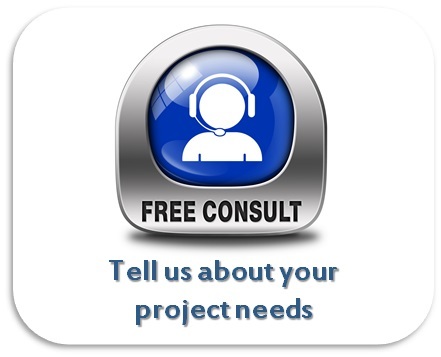 Our experienced assembly staff is aware that seemingly insignificant details can have a significant impact on the performance of your insulation system. A compromised multilayer insulation installation generally causes increased cryogen consumption and higher operating costs. 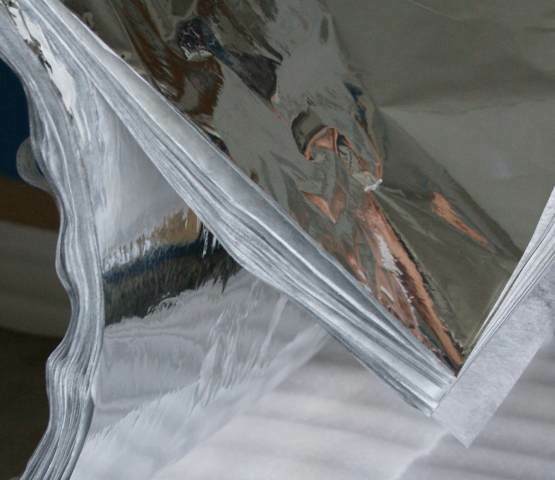 Insuring that multilayer insulation blankets are properly fabricated and installed is one of the ways in which Meyer Tool offers its customers the lowest total cost of ownership. Figure 1. Taping the edges of a blanket together can thermally short the warm and cold layers. Figure 2. Overlapping excess length brings the warm layer in contact with the cold layer. Figure 3. Failure to join multilayer insulation blankets when they meet can allow radiation from warm surfaces to reach the cold layers of a blanket. Figure 4. Attempting to spiral wrap with a single layer shorts the warm and cold surfaces together on each pass and leaves the edge of the blanket exposed to radiation.